ACUPUNCTURE directly stems from the Latin term acus - which means needle - and pucture - for puncture. Contrary to popular belief, acupuncture involves more than just poking needles through the skin. There are also different approaches to this traditional practice involving the application of heat, pressure, or lights to pressure points to help reproduce your body's natural flow. Cupping, or myofascial decompression, is one of the oldest and best deep-tissue therapies available. Small glass cups are placed on the skin and suction is created causing the flesh to be lightly drawn into the cup. They are left in place for about ten minutes, or may be gently moved across the skin (called “sliding” or “gliding” cupping). This can help break up adhesions and increase circulation, loosen muscles, and calm the nervous system. 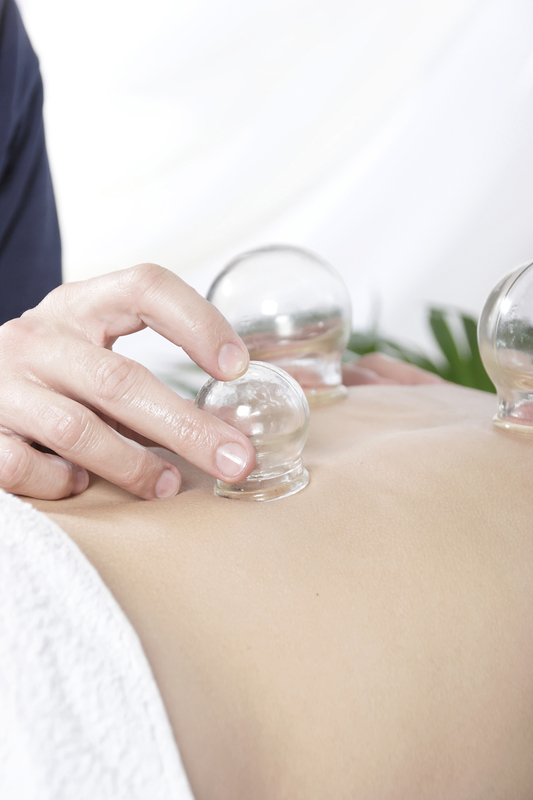 Cupping is often used to relieve back pain, stiff muscles, and it can help clear chest congestion. For most patients, it is a particularly relaxing therapy. Purplish circles that form during cupping fade in a few days. Similar to cupping, gua sha is a healing technique used throughout Asia for pain, mobility, inflammation, and immunity. Using a simple tool like Jade, friction is applied to an area to promote circulation and release soft-tissue adhesions. It produces anti-inflammatory as well as immune effects, and helps restore metabolic processes resulting in an immediate decrease of pain and stiffness. It feels much like deep massage and leaves some redness which disappears over several days. Sometimes known as intramuscular stimulation, dry needling is an invasive procedure in which a needle is inserted into the skin and muscle directly at a myofascial trigger point for persons with myofascial pain syndrome. A myofascial trigger point consists of multiple contraction knots, which are related to the production and maintenance of the pain cycle. Cosmetic acupuncture is often used as an alternative to surgical facelifts and other conventional procedures said to reverse signs of aging in the skin. Cosmetic acupuncture can help reduce wrinkles, diminish fine lines, remove age spots, and lift droopy eyelids. Most courses of cosmetic acupuncture treatment involve ten or more sessions, as well as additional sessions for maintenance of results. Raah Acupuncture Inc. work with licensed Estheticians to provide you the best facial rejuvenation experience possible. Raah Acupuncture Inc. takes great care to formulate effective, natural herbal products. We use only the highest quality earth-derived ingredients, including plant and mineral substances from the Traditional Chinese Pharmacopoeia. We sources only the highest quality herbs from Korean U.S. companies that lab test for proper species identification and to ensure the raw herbs are free of all contaminants. We may suggest herbal pills, powder or decoction to enhance treatments.